A military sniper’s edge is not only crucial, it’s also extremely extensive! Determining distance, selecting camouflage, preparing a suitable location, making sure that the rifle is well-sighted, having the correct mindset and showing patience are just some of the components that help form a sniper’s edge in the field. Without it, there could potentially be fatal consequences. Fortunately, for us civilians we don’t have to deal with the stresses of conflict. What we can do from here, however, is apply some of these elements a sniper uses to form a complete trading edge. What we mean by ‘complete’ is simply an edge which has all the necessary components to achieve consistency in the market. Know thyself. Understand what makes you tick. Are you impatient, greedy or fearful when money is on the line? This is something that needs to be addressed. Develop a trading method. Whether this be technical or fundamental, or even a combination of the two, this will have to be back tested and forward tested before an edge is considered present. Money management and risk. What risk/reward will you target, how much equity risk is allocated per trade etc.? Without preparation, life for both a trader and the sniper would be extremely hazardous. While the sniper prepares location, selects appropriate camouflage and makes sure the equipment is well maintained, the trader, assuming that a technical formation is used to trade, will typically prepare using the charts. Also of note, we believe it prudent to always be prepared for what economic data may throw your way. A high-impacting news event can, and usually does, run through most technical levels. Remaining vigilant of the entire picture in the markets is a crucial segment within a trading edge. This is critical. For a sniper, mastering the operation of his/her rifle is imperative. Without having absolute confidence in the equipment, the operator would likely hesitate when it matters most. The same goes for us traders in regards to our trading setup! The trouble here, however, comes from there being a myriad of different trading systems one can adopt, which often leaves newer traders overwhelmed. This is why we promote learning/mastering just ONE setup, especially in your initial years of study. Mastering (and trading) a single setup may seem boring when there is a plethora of trading setups to choose from. While this may be true, once you’ve proved you have a trading method with an edge in the market over a series of trades using one setup, you can then think about adding additional systems to your toolbox. As traders, we are attempting to pull money out of a very competitive market over a series of trades, using a collective edge. Unless you have mastered your setup, you’ll find it difficult to profit as your edge would be incomplete. 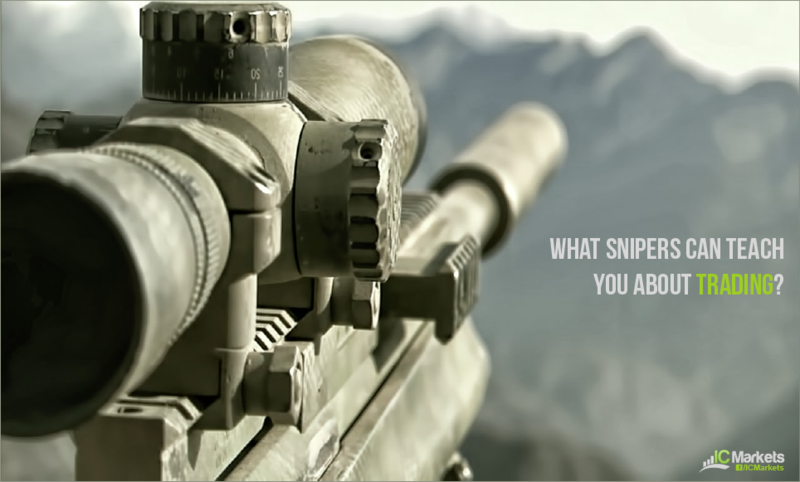 Do you think a sniper fires continuously when in the field? Highly unlikely. This is all done in practice. Similarly, this is why we believe back testing a trading method is so important. Think about it like this… how can one be confident enough to move on to mastery without first having the confidence in the method to pull the trigger in a live environment? Once settled into live trading, one should only be trading when the setup is present and correct. With no visible edge, you’re playing a VERY dangerous game! Trading one setup, of course, means you may not trade every day, but when the setup does eventually come into range, you’ll be prepared and ready, similar to a sniper, to pull the trigger – discipline at its finest! Sometimes snipers have to wait days for a target to come into range, as we swing traders often do! Over the long haul though this will help achieve consistency as you’re not attempting to machine gun the market, hence why we believe the less-is-more approach adds weight and complements a trading edge. And this leads us nicely on to our next point: patience. The dictionary definition states that patience is: the capacity to accept or tolerate delay, trouble, or suffering without getting angry or upset. A sniper, in our opinion, is the epitome of patience! And this is something a trader should try to emulate. Having the ability to sit and wait for the market to move into your strike zone takes a truckload of patience. But in order to become a consistently successful trader, this is a crucial ingredient needed to form a complete trading edge. Successful traders who have accomplished consistency have typically learnt to select trades in a calculated manner. Losing traders on the other hand attempt to machine gun their way through the markets, and only end up quitting once their ammunition has been exhausted. This is usually the point in one’s trading career where they either learn how to trade properly or leave the business altogether. Developing a collective edge similar to that of a sniper is a MUST if you wish to operate successfully in this business. Quite simply, an edge to a forex trader gives a higher probability of one outcome over another with positive expectancy. Without a COMPLETE edge it’s highly unlikely that you’ll succeed. A trading edge is a combination of the things we’ve discussed in this article and is, as you can see, NOT solely just the trading method. A trader with a mediocre setup, buckets of discipline and a well-formed trading plan which CLEARLY details money management and risk, will generally overtake a trader who has an awesome setup but lacks the remaining sections to fulfil a complete trading edge.